If you decided to celebrate a special occasion in style, then you probably know that no classy celebration goes without popping a bottle of some luxurious and expensive champagnes selection. This fizzy drink has been the poison of choice to many kings, queens, generals, politicians, famous historical figures and plenty of other people of high rank, which speaks volumes about the sophistication and class of the champagne. During the period between the 17th and 19th century, champagnes were available exclusively for royalties. Since these special wines were so desirable, it didn’t take long for many wine producers to find the secret to producing these sparkling wines and make them available and affordable for the middle class too. Today’s celebrities, athletes and wealthy people also follow this trend of drinking the best, which automatically translates to the most expensive champagnes, as all royal families did. While the champagne is certainly one of the finest and most enjoyable wine varieties, most people are more attracted to it because of its price. Champagnes are more expensive than any other alcoholic drink, which is why it is a common choice for big celebrations. France may be known as the homeland of this royal drink and referred to as the “champagne region”, but champagnes are today produced everywhere around the world. However, the atmospheric conditions and the grapes variety are not the same, so now we have a diverse selection of champagnes: from $10 a bottle to over $2 million Diamond-decorated bottle of champagne. One of the reasons why champagnes are more expensive than other wines is because its producing process is more expensive. Besides the liquid inside, the world’s finest champagnes are also known for their distinguishing bottles, which is another reason for their astonishing price. Even though wine makers today use more sophisticated techniques to produce wines, some elite brands still produce champagnes with eye-watering price tags. Below are the finest, the most popular and probably the tastiest champagnes that money can (or could) buy. If you ever win the lottery, make sure to celebrate it like a true winner with one of the most expensive champagnes in the world. “What on Earth makes this wine so special that their wine makers estimated its value over 2 millions?” That’s the question that pops into everyone’s mind when these numbers meet the eye. Alexander Amosu is the name of the person who produced the world’s most expensive wine – Gout de Diamants, which translated to English is the taste of diamonds. 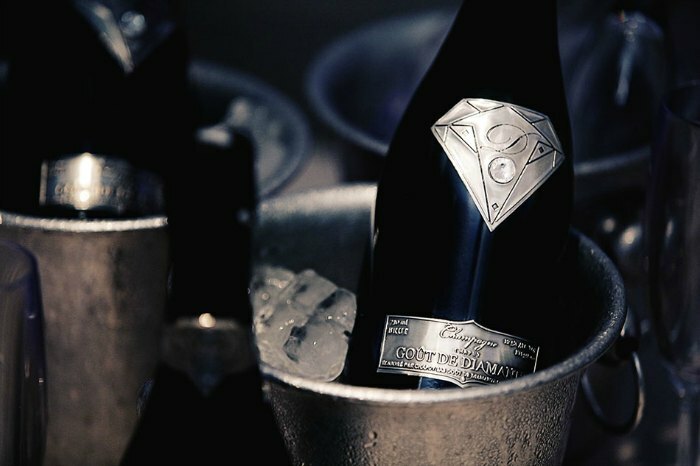 Besides the exceptional champagne contained in the bottle, what makes its price so high is actually the bottle, which bears a 18-carat white gold Superman-style logo with a flawless 19-carat white diamond on it. For those champagne enthusiasts who want to know what kind of blend makes a champagne worth $2.07 million, it is a 60% Chardonnay, 20% Pinot Noir and 20% Pinot Meunier. Years before “Gout de Diamants” was produced, this wine was considered as the world’s most expensive champagne. The legend says that during the WWI, the Russian Tsar Nicholas II commissioned a Swedish freighter full of wine and champagne, which was hit by a German submarine. 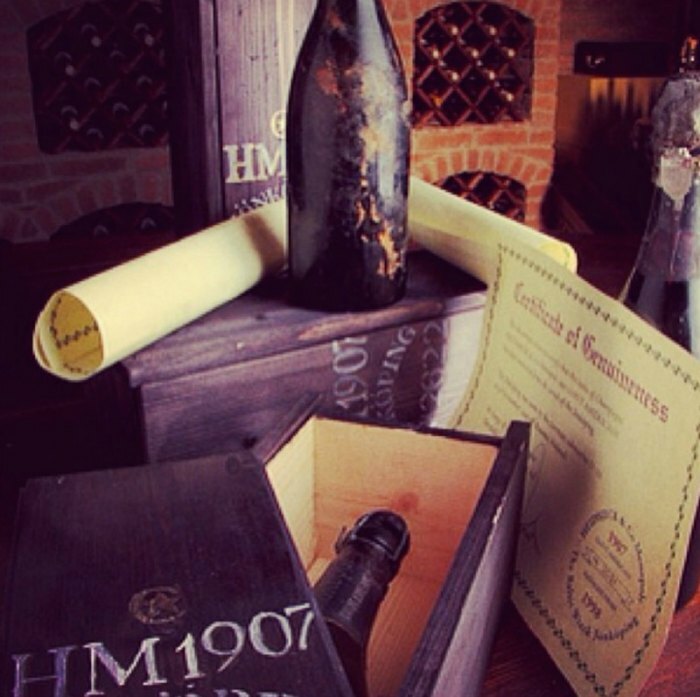 All of the freighter’s cargo have found the bottom of the sea, but in 1998, about 2000 bottles of the “1907 Heidsieck” champagne were found and sold as a historical novelty at an uction in Russia. One of these bottles went for astonishing $275,000. Here’s how some of those who tasted one of these bottles describe the wine: intense aromas of gunflint and black rifle powder, mixed with a briny note similar to roasted oysters, notes of graham cracker, flamed oranges, burnt lemon oil, caramelized banana, citrus, all followed by a salty finish. Maybe it’s the power of suggestion, but they think they could literally taste the shipwreck and the taste of sea along with the Champagne. Perrier Ricard Perrier Jouet is a famous name in the wine world, as it has been in the business ever since 1811. 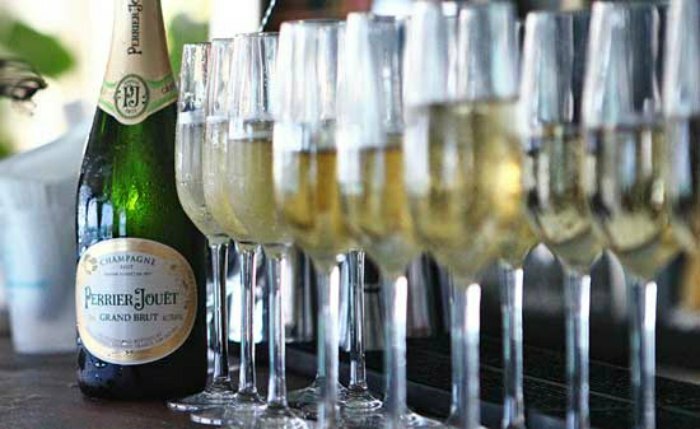 The Perrier-Jouet champagne comes in a 12-bottles pack, a pack that will surely evoke all of your senses. With fruity and lively notes, a soothing aroma, an elegant style and a unique flower(ish) bottle design, the Perrier-Jouet champagne has it all. This pack of 12 Perrier-Jouet champagnes brings you some vintage and exotic liquors and the class and sophistication to challenge everyone’s highest expectations for a bottle of champagne. 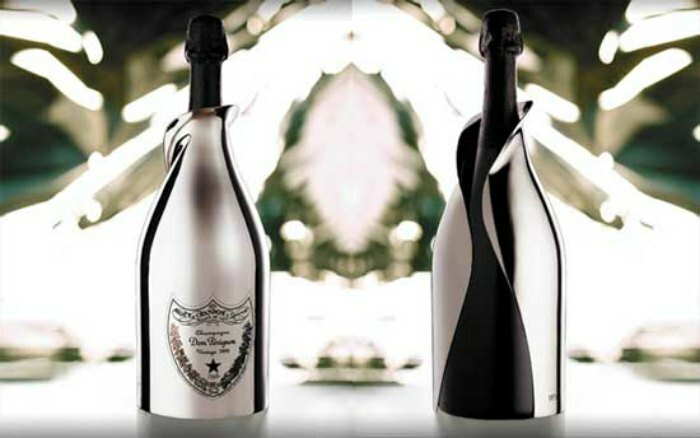 Dom Perignon is one of the most respectable and most popular champagne brands in the world, so it doesn’t come as a surprise that a bottle of Dom Perignon White Gold Jeroboam went for $40,000 at an auction. This exotic and sophisticated champagne is one of the finest and of course, most expensive champagnes ever made. With an utterly elegant bottle design and a magical poison contained inside, Dom Perignon White Gold Jeroboam is a treat that every true champagne enthusiast deserves. The Krug 1928 is not only one of the most expensive champagnes, but it is also the finest one that money can buy. With a medium gold color, a sweet bouquet of vanilla ice and bready notes, this champagne’s taste will surely force you to re-evaluate your selection of favorite wines and sadly, no Champagne other than Krug 1928 will be as desirable to you as once. To make Krug 1928 as quality as it is, only the best variety of grapes in the world are used. Despite its name suggests that Krug originates from 1928, the first bottle of Krug actually hit the shelves in 1938. The grapes for that first bottle were from 1926. 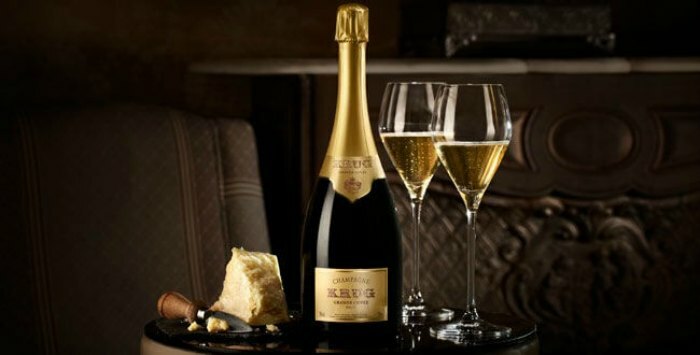 If you can handle its price, you can handle Krug 1928’s exceptional taste too. The famous French winery, Louis Roederer, is famous for producing some of the finest champagnes in the world. 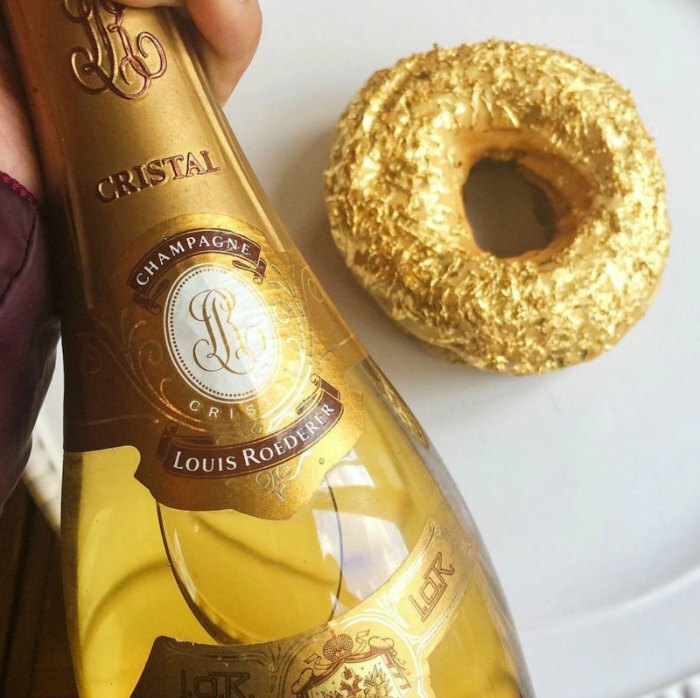 The Louis Roederer’s ‘Cristal’ Brut 1990 has been produced in limited bottling, which is why its price is over 17k. You can tell by its incredibly elegant, luxurious and classy bottle with a royal vintage label that there’s something special inside. It is expressive and vivid and develops stronger characteristics with age. With an intense floral bouquet consisted of white flowers, almonds and hazelnuts and a perfect mixture of finesse and power, this champagne offers a rare taste that you won’t forget for a long, long time.